Toilets weren't the only thing on Bill Gates' mind at yesterday's Techonomy conference in Lake Tahoe—the former Microsoft CEO also offered his vision of the future of education. 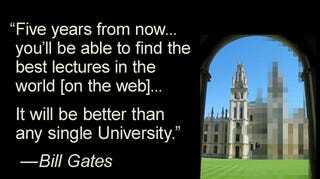 The next great educational institution, he thinks, is the Internet. Bill Gates Finds Toilets Oddly "Fascinating" And "Super-Important"
Five years from now on the web for free you'll be able to find the best lectures in the world...It will be better than any single university.